As you know, I have been a travel agent for a long time (coming up on 23 years!) and I specialize in All Inclusive Beach Vacations to Mexico and the Caribbean. However, I plan vacations to just about anywhere. I really enjoy putting together Europe itineraries, Disney trips and cruises as well. 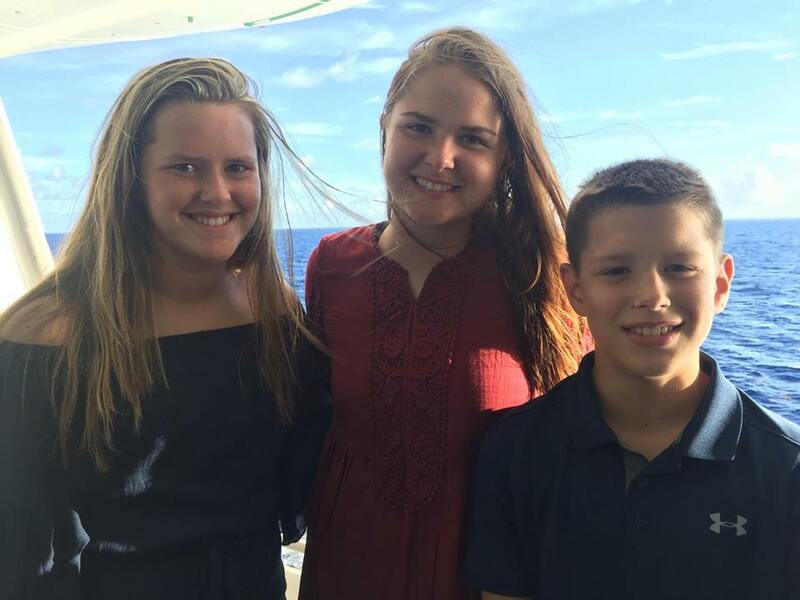 This post spotlights one of my favorite families and their cruise vacation that they experienced earlier this month! The May family has been on several cruises in the past years and they decided that they wanted to plan another one this summer. After narrowing it down, we chose Carnival Magic due to the wide variety of activities as well as the beautiful ports that they had not visited in the past. This particular cruise departed out of Port Canaveral, Florida. Porting from this location requires you to fly into Orlando and either rent a car or book a transfer and drive the 90 minutes to Cocoa Beach. We decided that they would rent a car due to convenience as well as the fact that they were flying in a day early for their cruise. I always recommend flying in a day early and booking a hotel close to the port. Departing a day prior relieves a lot of stress especially if there are flight delays or cancellations if flying in on the day of your cruise. This also allows my clients to start their vacation a day early and be well rested when they begin their cruise! We chose to have them stay at the Best Western Cocoa Beach. As you can see, it is directly on Cocoa Beach and many rooms offer ocean views. They had a special rate which included one night at the hotel, parking for a week and breakfast. Since they have stayed here before during one of their previous vacations it was the perfect choice. The port is only about 10 minutes away from the hotel so it is in a very convenient location. The hotel offers shuttle transfers for a small fee which is a lesser expense than parking your car at the port. After a good night's rest and a complimentary morning breakfast, they were all set to check out and begin their cruise adventure! They departed on the Carnival Magic on August 18th. This is a newer ship, built in 2011. We choose a Balcony cabin for them since it was not much more than a room with just a window. This way they could enjoy time each day looking out at the beautiful ocean and experiencing the fresh ocean air as they cruised from island to island. There are plenty of restaurant and activity options on this ship. Try a Lip Sync battle, laugh at the Comedy Club or relax in one of their many spas. They also have kids clubs for all ages, an on board water park and Dive in Movies. No shortage of things to do on this ship! The itinerary we chose stopped in 4 ports: Dominican Republic, St Thomas, San Juan Puerto Rico and Grand Turk. A perfect itinerary for the May family! 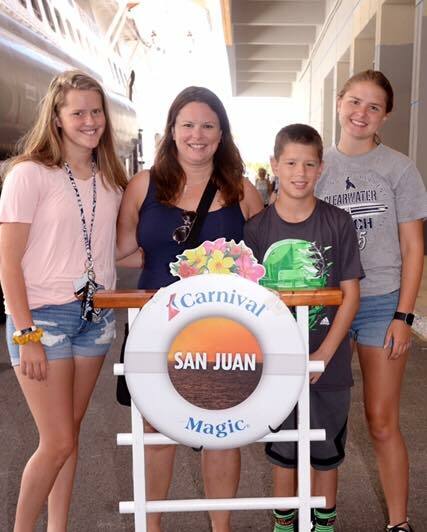 Their first stop after departing Port Canaveral was the port of Santo Domingo, Dominican Republic. Shopping is very popular at this port and is known for Larimar, a cloudy, pale-blue stone that is only mined on the island of Hispaniola. However, if jewelry is not your thing, consider Dominican-made cigars and items made from coconut, and natural cocoa or chocolate. Their second stop was St Thomas. This island offers something for everyone including unparalleled duty-free shopping. Other options for things to do on this island include: visit the world famous beach at Magens Bay, take a scenic tram ride to a mountaintop, or take a 20 minute ferry ride over to the tranquil island of St Johns. This is a beautiful island with so much to offer, a perfect stop when cruising the Caribbean! "We found a favorite! How beautiful is this place!? We stopped for lunch and our sweet waitress went back and grabbed her phone to show us her view from the hurricane last year. Almost a year later, some people still don’t have power. Unbelievable. Thank you Puerto Rico for your hospitality." Personally, I have not been to Puerto Rico. And I have not planned many vacations to this island, mostly cruise vacations that include this island on their itineraries. But after hearing about all the wonderful people on this island, I am putting this vacation spot on my list! Their final stop was Grand Turk which is a quiet, more laid back island. This is a perfect time to lay on a white sand beach or go horseback riding. There are not many excursions on this island, most cruisers find a spot on the beach and enjoy the white-sand beach and crystal clear water. However, if you want to do an excursion I would recommend Snorkeling or Swimming with the Sting Rays. Note to the May Family: Thank you for allowing me to share your experience with my readers. You 4 have a wonderful bond, it is truly awesome to see! I love being a part of creating happy memories for you and I look forward to planning your next adventure!